Established in 2018, under Curacao Wildblaster guarantees nothing short of a wild ride with that has the potential to blast gamblers Bitcoin earnings into the next stratosphere. With one of the best varieties of gambling options on their interface gamblers are spoilt for choice when deciding where to spend their Bitcoin. Once the decision has been made gamblers will be made to feel welcome and like royalty with all the promotions on offer from a great Welcome Bonus to a 6 tier VIP program These features certainly, make for repeat visits. While offering all the glitz and glamour in the gaming department, Wildblaster.com offers great support for players as well as making sure that their experience is secure in every way. Wildblaster is certainly a casino to visit if you want to let your hair down and go wild with wins, whilst knowing that the nitty-gritty is being taken care of. Unfortunately, players in USA, United Kingdom, Spain, France, and the Netherlands will not be able to take part in the fun. This Direx Limited owned casino also offers a fantastic affiliate program if making Bitcoin is your thing. One of the most impressive aspects of this casino is the fact that they have such a wide array of game offerings. 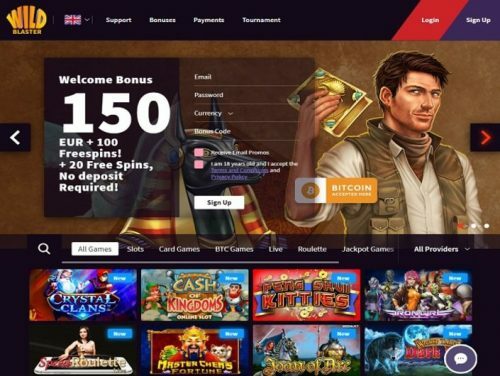 At Wildblaster gamblers are able to play on slots from the likes of NetEnt, Yggdrasil, Microgaming, iSoftBet, NYX Interactive, Betsoft, GameArt and a whole host of others. Each provider brings their A game to this top-notch casino. The myriad of games can be easily sorted by provider or gamblers can use the sites search engine to find their favorite title which could include Dead or Alive, Immortal Romance, Mega Moolah, Butterfly Staxx, or Mega Fortune Slot. Slot games aside, gamblers will not be unhappy with what is on offer on the tables. The blast continues with Blackjack, Punto Banco, Baccarat, Roulette, and Poker. Video Poker options include Jacks or Better, Joker Wild Poker, and Joker Poker. Live Casino is available for players who enjoy the feeling of the real deal. At any time of the day, players are able to log in from anywhere in the world to take part in live Blackjack, baccarat or Poker. This is easy to do with a mobile browser. Players do not even have to download an app. Wildblaster is all about the fun and this is evident in their promotional showcase. Whether players are there for a one-time gamble or are loyal Wildblasters, the bonuses and rewards keep coming. The only pre-requisite is the fact that players must be 18 and over. It is always worth mentioning that each bonus has specific rules and we always advise that players read the fine print of each one to understand what is on offer and how to best use the bonus. There are several currencies players can choose to deposit with including Euro, Rubel, Australian Dollars and Bitcoin via various payment options including Visa, Mastercard, e-wallet, or localized payment methods such as Yandex. Deposits are immediate and the steps easy to follow. To withdraw winnings from Wildblaster.com gamblers can make use of the same avenues as they did to deposit their money. Withdrawals are timeous with an average withdrawal taking less than 24 hours. The only exception is a Bank Transfer which can take up to 5 days to clear. There are maximum withdrawal limits which are €4000 per day €15,000 per week, or €40,000 per month. Players are asked to prove their identity with certain documents. Security of players identity and wallets has been well taken care of as has the fairness of play. The casino guarantees to be 100% Provable Fair in all its games using a Random Number Generator. To further ensure security, Wildblaster.com make use of high-end encryption systems which are verified by COMODO Limited. The Wildblaster.com support team are available 24 hours a day to assist with any queries and concerns via live chat. Queries are handled promptly and thoroughly. Players are also able to reach the professional team via email. Blast off on a wild ride with Wildblaster.com. With a name like this, players are promised great games, massive Bitcoin wins, blasting promotions and a great time in general, and this is exactly what this casino delivers. Gamblers will be entertained with all that is on offer at this relatively new casino. What’s even more impressive is the bulky list of Bitcoin exclusive games which draws in tech savvy, crypto gamblers to add even more value to the industry. We look forward to all that this casino will bring to the party. 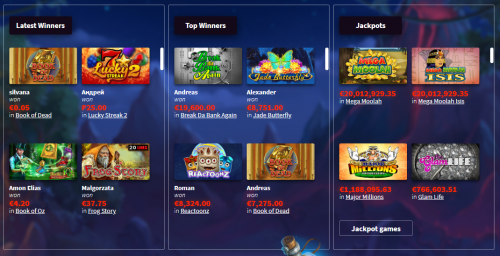 Wildblaster.com offers fantastic bonuses for gamblers whether they are first-time visitors or loyal customers who keep coming back to enjoy all that the casino offers. There is a great Welcome Package that allows first-timers to check out what all the fun is about. Added to that are Deposit Bonuses to keep on enjoying the rife that is Wildblaster. VIP’s are not forgotten and get special treatment in the 6 tier VIP promo. Regulars get to work their way up from Amber to Diamond and along the way get bigger and better cash backs, bonuses and prizes.